Someone to whom we are very close has just come through many months of pain, medical tests, worry, taking of much blood, indecision by medics, and three intensive courses of chemo-therapy. This was then followed by a major operation! All this has been borne with fortitude with only the very occasional (and perfectly-understandable) complaint. We have known this person for decades, and thought we knew them well, but the last few years have shown them in a sharper light. Courageous, tolerant about the condition, brave, accepting of the treatment, helpful to others in the same situation and optimistic, all come out high-up in the list of descriptors which would apply. No-one in their right mind would say that we should all have a dose of bad health, or bad luck, so that some alter ego could shine through ….because I think in a lot of situations it just would not work out that way! Many would become bitter, blame themselves or others, give up hope, and become introverted. As we encounter the cutbacks in government and local services, with unemployment rising in both wealthy and deprived areas, it is going to require an immense amount of positive, courageous and original thinking from everyone in our society if we are to see through the tunnel towards the light. In fact, not unlike what this relatively-young person has had to imagine, meet head-on and now look forward to…….. a better future. So is your glass half-full, or half-empty? All clear…well not just yet! Today, the Lady of the House was given the all clear that the macular hole in the retina of one of her eyes had been repaired successfully and that within about another three months she should have near-perfect sight again. This news was gratefully received, especially because some six years ago, two operations had failed on the other eye, and she now has no central vision there. The operation was complex, and she had had it under local anaesthetic! Her only comment to the surgeon at the time was that they were not to talk of football whilst operating, as she had heard every word spoken the last time! The joy that flooded her this morning was fully justified, as she has not been able to read, do sudoku, solve crosswords, type, drive, or carry out any job which required precision movements or views of something up-close. So her life has been brought back from the brink, and for this we have to thank the learning, skill, dedication, and patience of a group of specialists. So for all the complaints we hear about the NHS, we have to acknowledge a large debt of gratitude to these people. Be grateful that in this country, and the Western world in general, miracles still happen, and lives renewed. The same surgeon has a charity which saves sight in Ethiopia and a large cheque will be winging its way to help those less fortunate than have their sight improved. 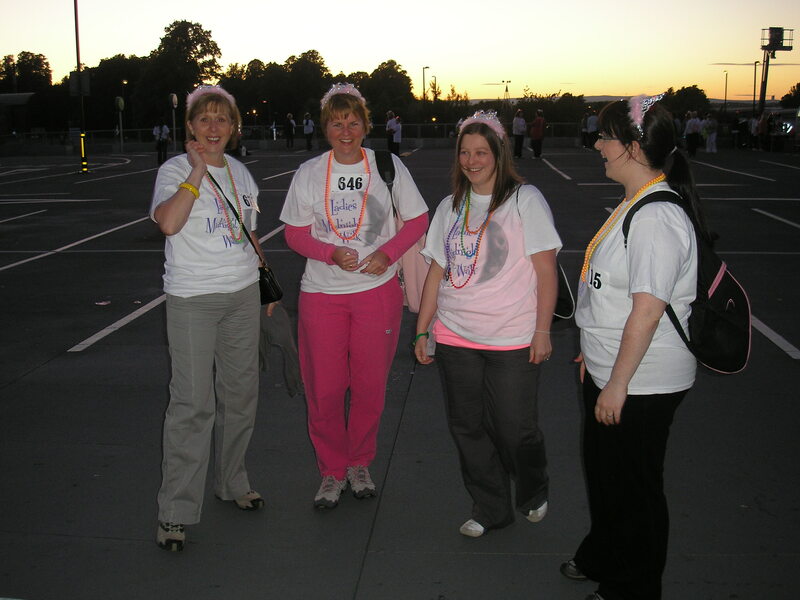 Lady of the House, Son, and I were at Hamilton, Lanarkshire, last night (the ASDA Car Park to be precise), to see off some 1300 ladies young and old on a Midnight Walk. It was a beautiful evening and the ground shook and lamp-standards vibrated to the dancing and gyrations of these ladies in ridiculous costumes. All sported pink, which is quite nice and feminine, but others had luminous tu-tus, sparkling tiaras, hideously-coloured leggings,etc, which were (I imagine) intended to chase off any male pursuers! Their intention was to walk some 13 miles (half a marathon, for goodness-sake!) from Hamilton to Bothwell, Blantyre and other assorted bits of the roads round the area. They were seen-off by fire-engines, escorted by police, marshalled by stewards all along the route. Both ASDA and Tesco provided some much-needed facilities. We let them get on with it whilst we headed off to bed, and ultimately hear of their safe return. The reason for the walk was to raise funds for St Andrew’s Hospice in Airdrie. This wonderful organisation has a tremendous shortfall in its finances of some £45,ooo per week, and with the government cutbacks likely to be announced this week, the situation will not improve. To put it in some kind of context, even one fewer shell per week fired in anger in our current battlefields would keep them afloat in their marvellous work…..think about that you politicians! Women have been aware of the scourge of cancer for many years, and the effect it can have on their well-being, as it is talked-about quite freely between themselves, and in the media. Not so with men…the macho image most of them have of themselves and their bodies does not sit well with self-examination, or discussions with doctors etc. It is well-known that early diagnosis and treatment is to be preferred, and yet the young virile male feels himself invincible and immortal. Not necessarily-so, guys! Take a lesson from the ladies, and maybe this time next year, we might see the equivalent walk with males, without the tu-tus, tiaras, and leggings, of course! Just now we’re getting a big return on the investment we’ve paid into the NHS over the years, so i will be having a sabbatical from postings during the near future. Will get back ASAP. ……But I will try to keep in touch with all those who are still posting. Kind regards…and keep us in your thoughts. Earlier this year I unfortunately had to make use of the Scottish Ambulance Service to take me to Glasgow Royal Infirmary after my little ‘medical event’. I could not fault the professionalism nor the care I received, and of course I made a full recovery. That was the end of that, I thought!…but no…… Last night I received a phone call from some survey team (company?) purporting to be speaking on behalf of the Scottish Ambulance Service. they wanted to question me on how I rated the Service. Besides the fact that I most certainly did not feel in any kind of mood at the time, to assess how they were carrying out their job, I was just not sure how to take this questioning. I asked a supervisor how they had got my name and phone number and was told that they had been given it by the Ambulance Service. I said that I felt that this was a breach of confidentiality, and refused reluctantly to answer any questions. Has anyone in scotland or elsewhere had any such experience such as this? Mine may be an isolated event, but maybe not, so I would like some facts before approaching them about the secrecy which I would have expected from them. P.S. I still think they did a good job that day!